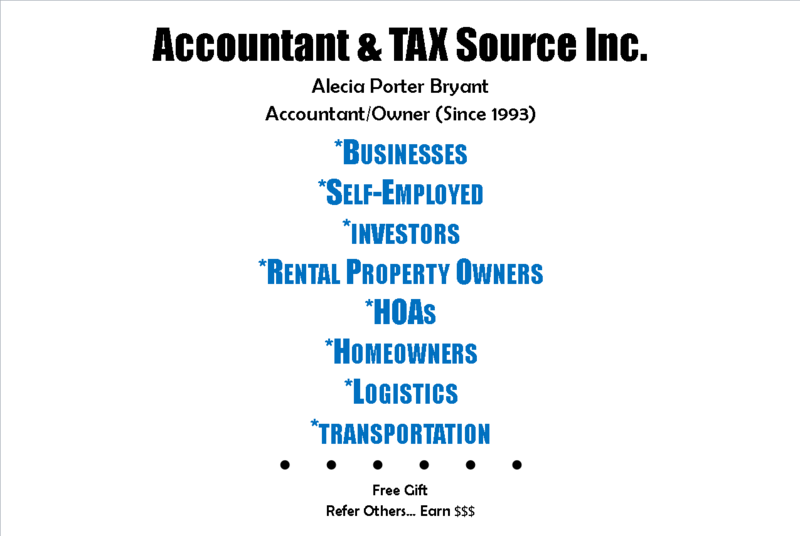 ACCOUNTANT & TAX Source Inc.
We're Tax Specialists not Generalists! Click 'Taxpayers' link at top of page and your industry. Don't leave $$$$ on the table. Find out what you credits/deductions you're entitled to! I was in and out within 45 minutes. The service was efficient, thorough, personable and accurate. ATSI always informs me of new things that can save me money. They ask all the right questions. Non-taxing atmosphere! Since 1995, ATSI has been preparing my financial statements, 1099s and tax returns. As a business owner and investment property owner, I feel they always do a thorough job, ask me questions to see if things have changed from year to year and give me a clean return.